Colour refers to the degree to which a diamond appears colourless. Diamonds are graded on a colour scale established by the Gemmological Institute of America (GIA) which ranges from D (colourless) to Z (strong yellow or brown). 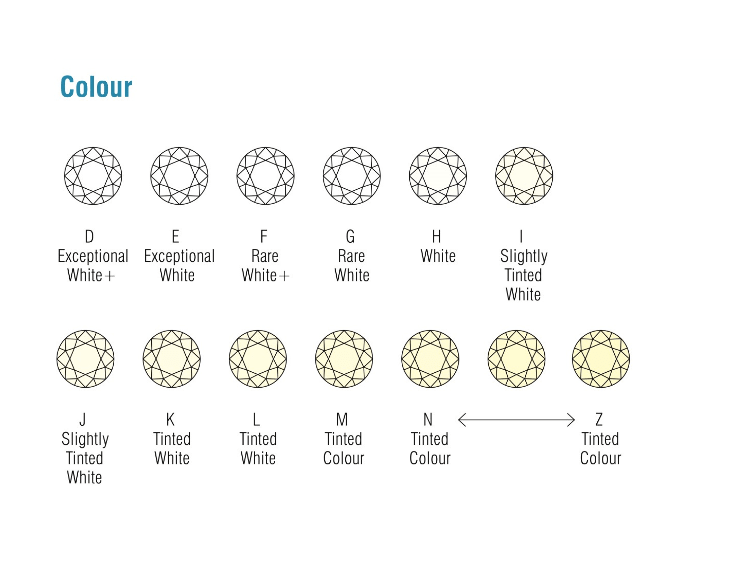 Whilst colourless diamonds graded D, E or F are treasured for their rarity and are highly valued, the near colourless grades G, H or I are also considered “white” but are more affordable. An important factor to consider when selecting Colour is the type of setting you plan on using. If you plan on mounting the stone in a Platinum or White Gold setting, consider a diamond in the D-G range. Yellow Gold will be more forgiving to a less than colourless stone, but regardless of the setting, the diamond will start to appear yellow if the Colour grade is lower than about J.
Diamonds can also be found in colours like pink, champagne, cognac, blue and black. These colours are referred to as ‘fancy colours‘ and are evaluated by a different set of colour standards.